“30th Thursday rather fine weather for the season, I did my choars was at the office all day & evening came home about 8 ½ & went to bed about 9 ½ tiard & nearly sick & lonely. “July 1st Friday fine warm weather with a light shower, I did my choars was at the office all day & evening came home about 8 ½ & went to bed about 9 ½ tiard & nearly sick & lonesome. “2nd Saturday rather fine weather & cool. I did my choars was at the office all day & evening came home about 8 ½ & went to bed about 9 ½ tiard & sick & lonely & homesick. “3rd Sunday A fine cool pleasant day & evening a very cool morning. I did my choars was at home all day, went to the office and went up to salt my mair come home & went to bed about 9 lonely & nearly sick. George & Elizabeth & Charles wen to Lewinses started 7 ½ with Waddles horse & wagon & got home in evening. Charles stayed to work but stayed till middle of week. “4th Monday rather fine weather for the season. I did my choars was at the office all day & evening came home about 8 ½ & went to bed about 9 tiard lonely & nearly sick George & Elizabeth went to Pelhams to the fourth. “5th Tuesday rather fine dry weather but cool nights. I did my choars was at the office all day & evening came home about 8 ½ & went to bed about 9 ½ tiard lonely & sick. “23rd Thursday fine growing weather & things grow fast, some clouds, I did my choars was at the office all day & evening came home about 8 ½ & went to bed about 9 ½ tiard, nearly sick and as lonesome & lonely as I can ______ ______. “24th Friday fine hot growing weather. I did my choars was at the office all day & evening, came home about 8 ½ & went to bed about 9 ½ tiard & nearly sick, lonesome & lonely. “25th Saturday fine hot growing weather. I did my choars was at the office all day & evening came home about 8 ½ & went to bed about 9 ½ tiard, nearly sick & lonesome & lonely. “26th Sunday A warm cloudy morning but a pretty pleasant day & evening with a very heavey breeze all day & some cloudy fine growing weather I did my choars went to the office & ________ & went down about noon & back I hoed in the garden planted some cucumbers & choared round some went up to Cal’s paster to salt my mair & went to the office at night and called at Blisses, came home & went to bed about 9 ½, lonely & unhappy. “27th Monday rather fine weather for the season but pretty cool & dry generally, I did my choars was at the office all day & evening came home at 8 ½ went to bed at 9 ½ nearly sick & lonely. “28th Tuesday rather fine warm weather dry. I did my choars was at the office all day & evening came home about 8 ½ & went to bed about 9 ½ tiard & lonely. As the Warrenville Fire Protection District celebrates its 75th anniversary the Historical Society is helping commemorate the organization’s milestone. In honor of the formation of this vital community institution, the following details the second of two fires in the mid-1930s which pushed the people of Warrenville to form the district. The first fire, that of the first Warrenville Baptist Church was detailed in our winter newsletter, a copy of which can be found on our website. For more information about the District’s anniversary visit their website http://www.warrenvillefire.com. The Museum will have a display of Fire Department’s Anniversary through the end of the year. On Saturday, March 7 the Bertha MacDonald residence on Batavia Road went up in flames. This time there was action. It took only four days to get a group of aroused men together in St. Irene’s hall. 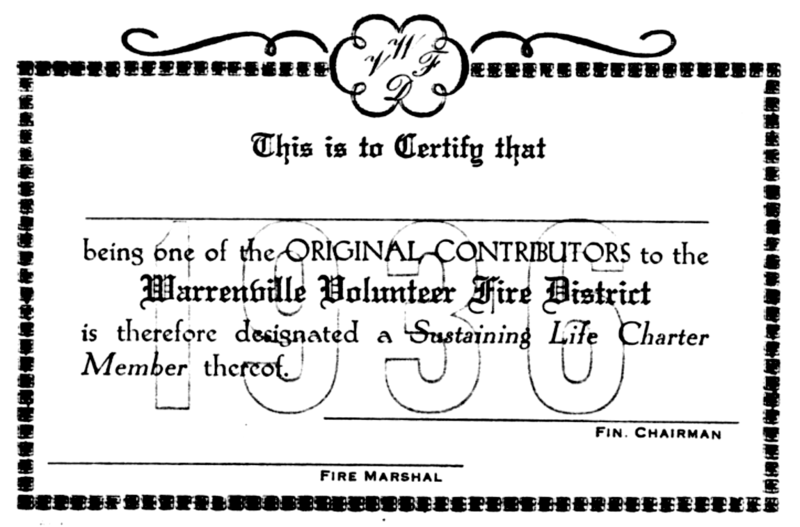 When they left that memorable Wednesday evening, March 11, 1936, they had made plans for the formation of the Warrenville Fire District and the financing of firefighting apparatus, they had signed up a company of volunteer fire fighters, and they had obtained $500 in pledges to start off the drive. In the ensuing weeks solicitation letters for funds went out and the traditional annual benefit dance was inaugurated in April. By June 13 the fire truck which had been purchased was exhibited and demonstrated at an outdoor festival and dance. The mettle of the new recruits was put to the acid test in six months, during the night of January 26, 1937. In frigid temperatures they were called to battle a blazing apartment house on Batavia Road and Fourth Street (the final remnant of the Seminary dormitory and later Colonel Warren mansion). The occupants had been thawing out water pipes in the basement with homemade kerosene torches shortly before 6 o’clock when the building caught fire. Before the alarm could be sounded, flames shot up inside the walls, attacking both floors and the attic. It was a long night for the firemen, according to the Chicago Daily News. “Volunteers on the scene a few minutes later removed furniture from the Charles Chester family apartment upstairs, and the Roy Stanton family quarters on the lower floor. With bucket brigades filling the booster tank of the single fire engine, water was played on the flames for more than two hours. The fire department has made tremendous advances since those early trials. 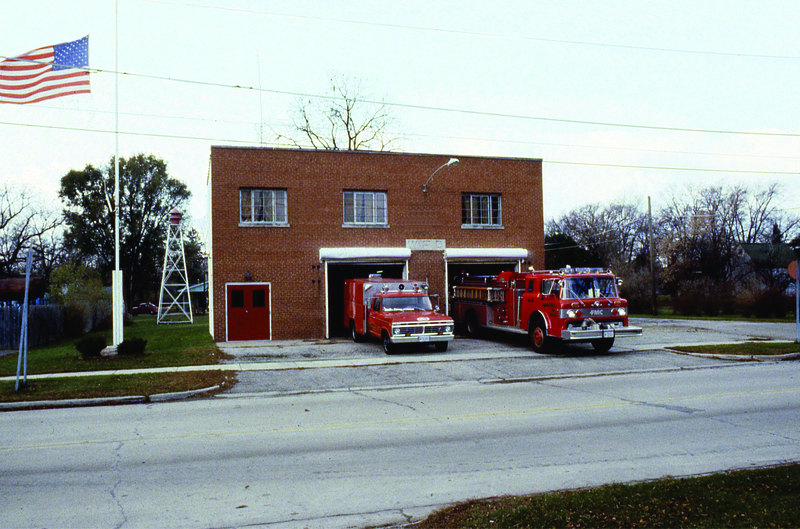 The original Warrenville Fire District was incorporated as the Warrenville Fire Protection Company, August 11, 1937. Following a general election July 3, 1939 it became a taxing body, incorporated as the Warrenville Fire Protection District. When it became clear that more and better equipment was needed, along with a base from which to operate, a second organization called the Warrenville Volunteer Firemen’s Association was formed. This group in 1946 purchased the Baptist Church lot, the Baptists having opted to build their new church on Warren Avenue. “16th Thursday rather cool & dry for June. I did my choars was at the office all day & evening came home about 8 ½ & went to bed about 9 ½ sick & lonesome. “17th Friday Fine weather but more warm & dry. I did my choars was at the office all day & evening came home about 8 ½ & went to bed about 9 ½ nearly sick & homesick & lonely. “18th Saturday A fine hot dry day some cloudy. I did my choars was at the office all day & evening came home about 9 & went to bed about tiard & nearly sick & lonely as death. George A Potter went to Wheaton & Danby came home in the stage about sunset tiard & sick eat no supper. “19th Sunday A warm cloudy damp morning & we had a shower during the night or in the morning, cleared off hot was some cloudy all day & looked like showers, I did my choars was round home the most of the day hoed in garden & worked in celler went to office with H Gould about 4, he and family went up to Caroline Wrays about 11, I worked amost all day went to bed about 9 tiard lonesome & about sick. George was not up to eat breckfust till after & went out but soon got well after getting over being ashamed [in margin] Henry Gould went to Cal Wrays. “20th Monday rather a fine day & evening, I did my choars was at the office all day & in the evening came home about 8 ½ & went to bed about 9 ½ tiard & nearly sick & lonely. “21st Tuesday rather a fine hot dry forenoon & rained a pretty hard shower between 1 and 2 it rained tremendous hard for a short time it was very dry until the shower came which helped us much. I did my choars was at the office all day & evening came home at 8 ½ went to bed at 9 ½ sick & lonesome [in margin] first shower for many week. “9th Thursday fine cold dry weather for June, I did my choars was at the office the most of the day & evening came home about 8 ½ & went to bed about 9 ½ tiard & nearly sick lonesome & lonely. Capt Ed Munk took the 3d degree in Masonry tonight. “10th Friday rather a cold & a very cold night for June almost freezing. I did my choars was at the office till near 10 then went to Naperville with James Hoyt & H. D. Fowler to prove up the will, came home about 2 & stayed at the office all the rest of the day came here about 8 ½ & went to bed about 9 ½ nearly sick & lonely Capt Ed Munk started Chattanooga today & sent 50 dollars to get William Wrays body by Ed Munk. We heered that Dr S H Potter was shot & his boddy on its way home [in margin] mair to horse cold Ed Munk started for Army. “11th Saturday A very cold morning & day for June a little frost but the wind kep it off. I did my choars was at the office the most of the day, went with Pollard & T. Jones to Hoyts & appraised his personal property in forenoon came home at 8 ½ & went to bed 9 ½ tiard sick lonely etc, a lonesome day & night, Rollen Willson George Potter, Caroline & Elizabeth went to Aurora, got back at 5 oclock. “12th Sunday A cold morning & a little frost very cold dry weather for June, I got up at 6 did my choars was at office, eat breckfust about 9 ½ choared round was at Hoyts, took my mair to Pollards paster on the Col Warrens came home from office 8 ½ & went to bed about 9 ½ nearly sick & lonely a little frost this morning. “13th Monday rather fine cold weather dry weather for the season. I did my choars was at the office all day & in the evening came home about 8 ½ & went to bed about 9 ½ tiard & sick & lonely. “14th Tuesday fine cool dry weather. I did my choars was at the office all day & in the evening came home about 8 ½ & went to bed about 9 ½ tiard & nearly sick & lonesome. Dr. H S Potters funeral at Danby, Wm. Potter & his mother came here. The Warrenville Historical Society was officially formed on June 9, 1980, but the organization did not have a proper home until 1984. During its early years, the organization met at various places throughout the community. After the insolvent Adam Emory Albright Memorial Foundation deeded the former Albright Studio to the City of Warrenville in 1981, the City began to renovate the building as a space for its new cable operator, Centel Communications, in March of 1982, and allocated a third of the building as the new home of the Warrenville Historical Society. After two years of work, the Warrenville City Museum officially opened on June 3, 1984, at 2:00 p.m. in the historic Albright Building, 30 years ago today. This vision was realized in no small part due to the work of city leaders, through the sale of property conveyed by Ivan Albright (who died just months before the Museum was opened), through the sale of artwork donated by Josephine Medill Patterson Albright (Ivan’s widow), and through the generous donations of local individuals, organizations and businesses. The grand opening was a beautiful June day, however Second Street was still under construction in the middle of a sewer project. The Warrenville Community Band played to celebrate the event, amongst the construction equipment. Mayor Volkmer welcomed the visitors and press to the new museum. The very first museum guests who entered the space that is now the Museum’s Art Gallery, were invited to view historic documents from Warrenville pioneer families on display and other treasures that told the story of the 151 year old community. Since that monumental day in 1984, we are happy to say the City of Warrenville has allowed for the Museum to expand to fill the entire Albright Building with items from its almost 5,000 piece collection of Warrenville history. Stop in to the Museum this summer during our expanded gallery hours, Wednesdays and Sundays from 1:00 – 4:00 p.m. and join us during the Warrenville Public Library’s first summer concert, Wednesday, June 4 at 7:00 p.m. (weather permitting) to enjoy a sweet treat in honor of our 30th Anniversary. “2nd Thursday A fine day but cool I did my choars was at the office all day & evening came home about 9 ½ & went to bed tiard & nearly sick & lonely as can be [in margin] Dr H S. Potter was killed by a bounding shell a strikeing him in the head. “3rd Friday A fine day for June but cool. I did my choars was at the office all day & evening came home about 8 ½ & went to bed about 9 ½ tiard loanly & nearly sick [in margin] Bolway brought pigs. “4th Saturday A fine pleasant warm day & evening. I did my choars was at the office all day & evening came home about 8 ½ or started & met Malissa Billings saying that Mr Hoyt was a dyeing went up & he was ded died very sudden, Jonathan Pollard H D Fowler was there & Beardsley helped us lay him out the house was full we stayed till 11 ½ & locked him up & came home & went to bed he died between 8 & 9 evening. “5th Sunday A fine day but some cloudy. I did my choars was at Mr Hoyts about 9, a while choared round some came home about noon went up to Caroline Wrays about 2 & stayed till about 4 or 5 George & Elizabeth went up in forenoon & Rollen brought us back I found my cow the other side of Lahmans & turned her into Lahmans yard with his bull came home did my choars went to the office & round home about 8 ½ & went to bed about 9 nearly sick lonesome & down spirited. “6th Monday rather fine cold weather for June, I did my choars was at the office all day & evening came home about 8 ½ & went to bed about 9 ½ nearly sick & lonely. James Hoyt got here about one oclock at night & eat a bit & went to bed with Charles & me. “7th Tuesday A fine but cool day for the season. I did my choars was at the office the most of the day & evening came home about 8 ½ & went to bed about 9 ½ sick & lonely. Mr. Hoyts funeral was today at the Methodist Church.